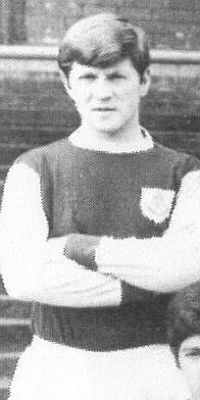 Whilst never able to establish himself as a first team regular, he did make a total of 51 appearances for the Clarets, of which 44 were in the Football League, and his last appearance, in August 1965 was a piece of Burnley FC history. He made his debut at Birmingham in April 1961, coming in for John Connelly in a game we won 1-0 courtesy of a penalty from Jimmy Adamson, and in the 1961/62 season made ten league appearances. He played in five of the last seven but was left out of the FA Cup Final side with Gordon Harris returning to start the game and Towers named as twelfth man. The 1964/65 season proved to be his best. He played in half of the games that season, mainly on the left wing after Harris had moved to inside left, but as the season went on he was in and out of the side with competition from Johnny Price and then newcomer Ralph Coates. A 2-0 defeat at Stoke in April 1965 was his last league start for us and there was just one more game to come in the league. The 1965/66 season saw the introduction of substitutes in English football for the first time. Although not permitted in the cup competitions, clubs could name one substitute for league games who would be permitted to replace one of the starting players, but only in the case of an injury. Towers was named as the substitute for the first three games and in the third, a 2-2 home draw against Arsenal, he replaced the injured Willie Irvine for the second half, coming out with no number on his shirt. In September he played the League Cup game against Doncaster, scoring too in a 4-0 win at Belle Vue, but it was to be his last appearance for us., and in January 1966 he took the decision to move to Oldham in a £20,000 transfer. In two and a half years at Boundary Park he was hugely successful and became their leading goalscorer. He scored 27 goals for them in 1966/67 and when he left for Bury in the summer of 1968 he'd netted 45 times in 95 appearances. Three years at Gigg Lane saw him add just seven more goals in 45 games before he decided to leave England for South Africa where he played for and coached at Cape Town and Hellenic. He remained in South Africa and it is there where he has sadly passed away. My thoughts are with his wife Pat and his two sons and daughters at this sad time.